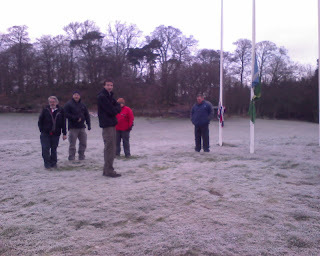 Above : Waiting for the scouts (who will never arrive) at flagbreak on a particularly cold morning. Well, despite a lack of blog updates last month there's been loads happening on site - so here's a quick roundup of everything which has been going on...and the usual random photos. November started off with a busy busy weekend - with not only a good few groups staying but also a first aid course and GNAS (archery course) being run for some of the staff and others on site. 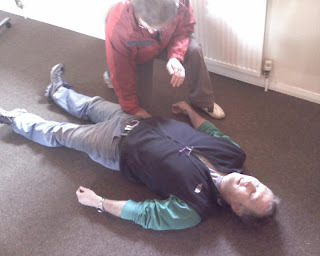 The first aid course was run by our very own Brian, and was designed to be a refresher as everyone on it had already been on a full course. Over 2 days, roughly 12 staff went over various first aid scenarios which may be expected to happen on site, and covered the usual bandaging, CPR, burns treatment etc. Brian did a great job teaching the course (except for some memory-loss when it came to tying a particular knot) and even found time to show everyone his slideshow from a recent aid trip where he drove an old fire engine all the way to Bosnia and trained up firefighters there. He also employed the dirty trick of showing everyone some particulary gory photos of wounds just before teabreak, just so that it would ruin our appetites and he could have all the good biscuits to himself. Above : Bob teaches Brian how to tie a reef knot properly. 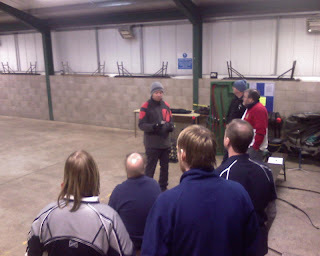 Meanwhile, the GNAS course (part one) was taking place in the wet weather hall - this is run annually and is aimed at training up people in order to allow them to instruct archery sessions. As most of the staff are already qualified the spaces were filled with external participants, including local leaders and a few from much further away (Aberdeen). Again there were around 12 on the course which made for a few problems at lunchtimes when there was a bit of a fight for the limited number of sausage rolls. Above : Getting in some group practice at the GNAS course. Onwards a week and a fairly normal weekend with a few groups staying and quite a few activities. The following week, however was much busier, as there was a big SSAGO (University Scouts/Guides) camp with around 150 participants. 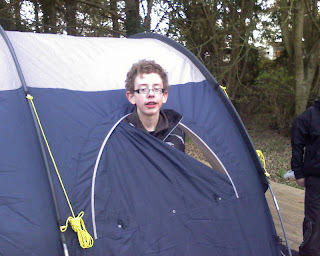 The event had been meant to be running elsewhere, but after a big problem with the intended campsite the organisers had spent ages trying to find a suitable replacement venue, and luckily Fordell was available. There were groups from all over Scotland and England - arriving friday night and staying till sunday afternoon. Saturday saw everyone head into Edinburgh to take part in lots of different bases/activities, which gave the staff back here a fairly easy day as there were no other activities on. The groups arrived back later on and had a ceilidh and campfire which seemed to go well, and which was much quieter than expected (what happened to noisy students?). The Fordell staff who were in weren't able to participate in the ceilidh as they'd overindulged at teatime with a huge Indian banquet and were unable to move for several hours afterwords. 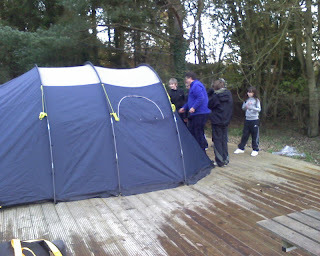 Above : Local scouts check their tent, which hasn't been used since their 2001 summer camp. Above : The mystery of the beaver who disappeared during the 2001 summer camp ' hide and seek' competition is finally solved, as he emerges victorious and slightly hungry. 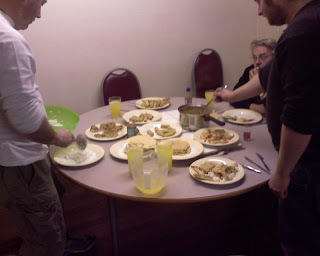 Above : Fordell curry night. Last weekend saw the second weekend of the GNAS course, where the participants spent saturday learning more skills/techniques, practicing groupwork and getting ready for the assessment on sunday. The course seemed to go well and we look forward to seeing some of those who passed back in at Fordell with their own groups or maybe coming along to help us out with activities from time to time. 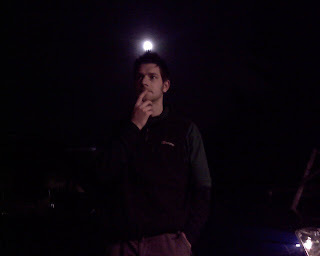 Above : Stevie has a bright idea. Weather-wise, it's definitely getting much colder so there's a fair chance that there'll be a few snowy photos on the next blog update, maybe even from this weekend coming if the weather forecasts are to be believed.